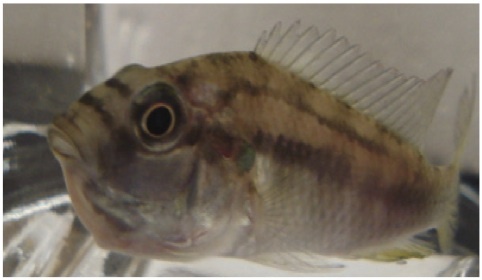 African cichlids, Astatotilapia burtoni, mouthbrood their young for at least two weeks, during which time the females voluntarily starve themselves, losing a large percentage of their body mass. In the Ren lab, there are two strains of A. burtoni- wild stock (WS) fish brought in from Africa, and lab stock (LS) fish that have been inbred for nearly 30 years. WS fish exhibit "good" maternal behavior- they mouthbrood their young for the full term, and display aggressive behaviors to protect their fry. In comparison, LS mothers exhibit "bad" maternal behavior, frequently eating their own eggs and fry (Carleton, 2009). It was also discovered that LS lose more body mass while mouthbrooding than do the WS mothers (Ngyun, 2010). This difference in behavior is thought to be caused by a loss of ability to appropriately decrease metabolic rate. In the interest of time, my thesis focused on metabolic differences in WS A. burtoni, though it lays the groundwork for future studies that could compare the two strains. This study used a three pronged approach by measuring physiological, behavioral, and molecular traits to assess metabolic differences in brooding, fed and starved WS females. Metabolic rate was measured with a respirometer. 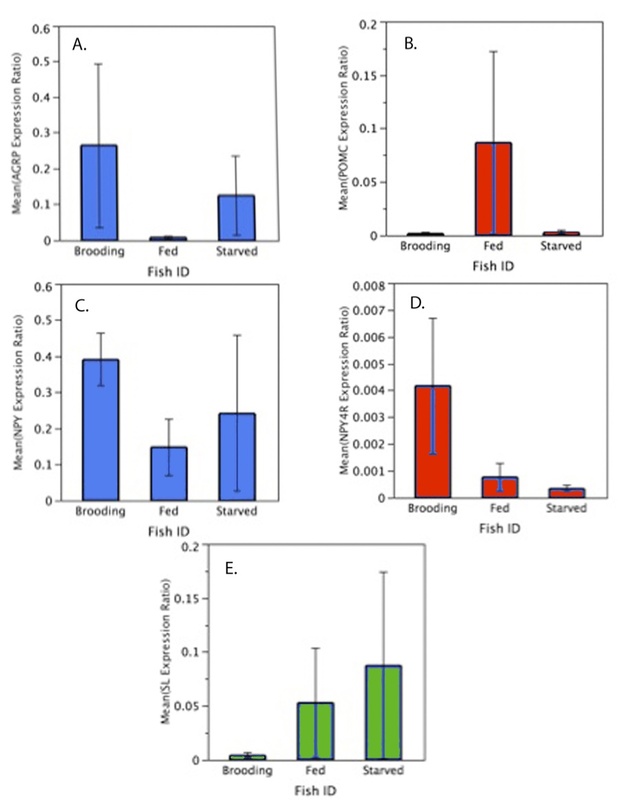 Measures were taken twice for each animal in each respective condition, and the data suggest that brooding fish are able to decrease their metabolism, in comparison to starved and fed controls. 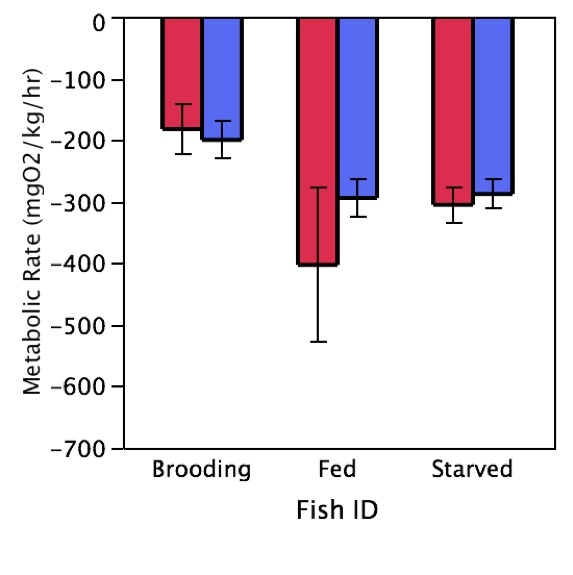 The respirometer data reveals a trend that is consistent with the hypothesis- that fed fish would have higher metabolic rates than brooding and starved fish. It was predicted that the brooding and starved fish would have similar metabolic rates as well, similar to those seen in the Mrowka (1984) study. The trend suggests that these rates may be similar, though the starved fish appear to have higher rates than the brooding fish. This subtle difference between brooding and starved fish could be explained by the condition of brooding. It is likely that the brooding fish have entered a state of conserved metabolic regulation, in comparison to the starved fish. However, this subtle trend is not statistically significant, again, likely due to the small sample size. Mean metabolic rates for brooding, starved and fed conditions, shown with standard error bars. The red bars represent measurements taken on day 7, the blue bars represent measurements from day 14. There were 3 females in each of the starved and fed conditions, and 2 females in the brooding condition. Behavioral measures suggest that the loss of appetite phenotype seen in brooding mothers is governed by the long-term neurological control of feeding. The brood care motivation experiment is a measure designed to look at the ability of the mother to suppress “hunger,” and is related to the long-term mechanism of feeding. Mrowka (1980) discovered that brooding fish stripped of their fry ate less on average than starved and fed controls. His experiment was replicated (with modifications) in the WS A. burtoni, and a similar trend was found, which was expected. Interestingly, the fed fish ate the most, followed by the starved fish. It seems as though the starved fish would be the hungriest, but their metabolic regulation might have adapted over the two weeks, and perhaps they weren’t able or didn’t desire to eat as much. The brooding fish ate the least, on average, which could indicate that the long-term control over their metabolism was still in effect, telling them they weren’t hungry. 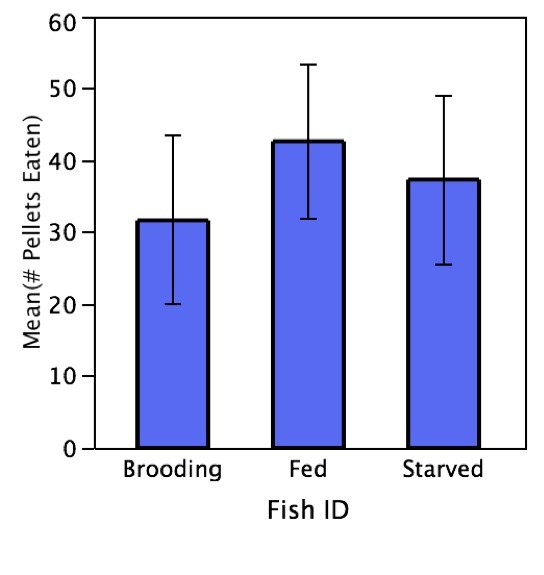 Mean number of food pellets eaten in a one hour time period for brooding, fed, and starved fish. There were 3 fish in each condition. Each had been isolated for two weeks, and tested on day 14, with the exception of two brooding fish, which were stripped of their fry and tested on day 12. Fish were given a total of 100 pellets, dropped into the occupied side of a divided tank, and the number remaining was used to calculate the number eaten. Graph is depicted with standard error bars. qPCR measurements of mRNA transcripts of neurotransmitters involved in feeding regulation suggest that there may be differential patterns of regulation across experimental groups. 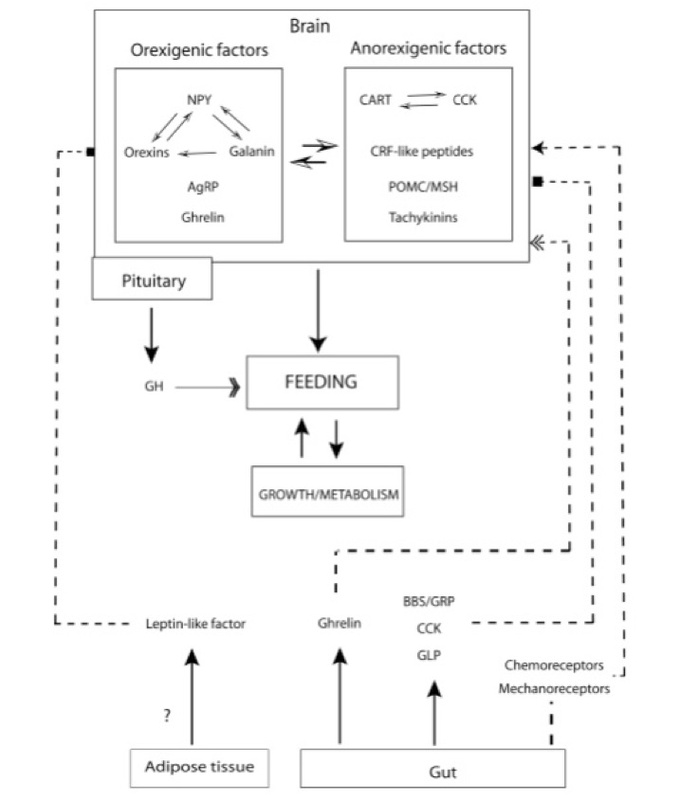 Orexigenic neuropeptides neuropeptide Y (NPY) and agouti-related protein (AgRP) appear to be upregulated in the brooding and starved groups, whereas anorexigenic neuropeptide pro-opiomelanocortin (POMC) appears to be downregulated in these groups. NPY-4 receptor appears to be upregulated in only the brooding fish, whereas somatolactin (SL) appears to be downregulated. While these results were drawn from small sample sizes, the trends suggest intriguing patterns. More work on this topic is warranted and should allow us to truly understand the differences between the 2 groups. Mean expression ratios for all 5 genes of interest. Mean expression ratios calculated automatically by the LightCycler software, for all 5 genes of interest A) AgRP, B) POMC, C) NPY, D) NPY4R, and E) SL across the brooding (n=2), fed (n=3) and starved (n=3) experimental groups for orexigenic (blue), anorexigenic (red) genes, and one of an unknown function in appetite regulation (green). Error bars indicate standard error. The strength of this experiment was the three level approach. 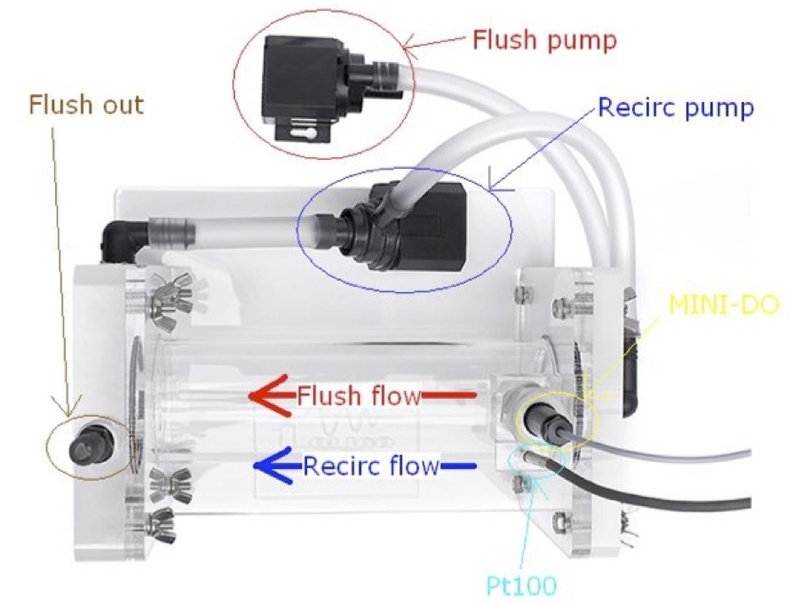 Since there are many discoveries yet to be made in the field of feeding regulation in fish, analyzing mouthbrooding at different levels really allows for a more broad understanding of what is going on. For example, if we see changes in metabolism and in behavior that aren’t explained by the qPCR results, then clearly we aren’t looking at the right systems. Behavioral and metabolic observations could guide the search for genes that are differentially regulated, and are important for understanding their potential functions. As there are a group of scientists that are pushing for fish as a new model for vertebrate feeding regulation, there will be new discoveries of genes influencing feeding regulation, and specific discoveries of function. This coincides with a movement within the sciences to unite formerly disparate subsections. Therefore, this study, combining behavioral, physiological, and molecular measures, comes at a very exciting time for the field.